Your Pot & Pan Shelf Kit includes 3 solid wood pullout/rollout shelves and all hardware for converting a cabinet opening to the perfect pot & pan storage system. 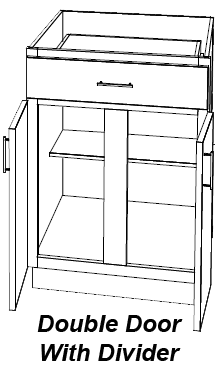 QuikTRAY Rollout System support posts (pilasters) for installation in standard cabinets. Download installation instructions at bottom of page. 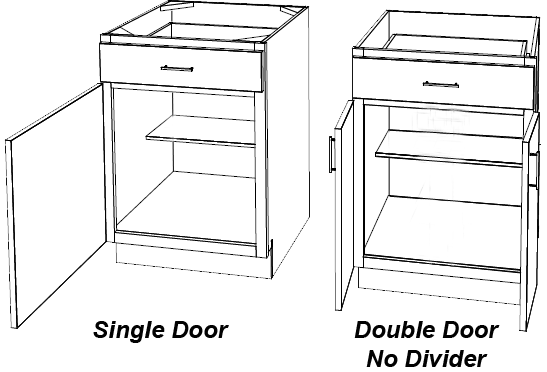 For cabinet openings greater than 25" width the bottom thickness will be upgraded to 1/2"
Recommended minimum opening height of 21"
You must download, complete and submit the QuikTRAY Worksheet for calculation of pullout shelf size. 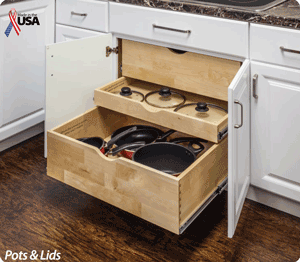 The Pot & Pan kit is comprised of one 6" and one 9 1/2" outside height, deep style shelves and one 3 1/2" tall shelf. 3" height is available instead of 3-1/2" if needed to meet height requirements. Widths and depths are based on submitted worksheet dimensions. 1/4" plywood bottom for cabinet openings less than 26"
Solid wood tray is our 5/8" thick white birch tray as shown here, substitutions are not available. All orders require completion of the QuikTRAY Worksheet to determine final assembled size of pullout/rollout shelves.